A constant and recurring struggle for me (and many writers, I'm sure) is the avoidance, balance, and/or embracing of clichés in their work. What is a cliché? Typically, it's a tried and tired concept or idea that's used so much that its originality or meaning is lost. This is how stereotypes are born. For example, if I were to mention Japanese Animation (or Anime), what's the first thing that comes to mind? Giant swords? Crazy hair/outfits? Forming balls of energy out of thin air? You get the idea. I've watched a lot of Anime and know that they don't always have these elements, but that was my impression for a long time (thank you, Miyazaki). No matter the genre, there are unavoidable clichés that you have to deal with (or work around) in your writing. Does this necessarily mean you must avoid clichés? It all depends on your approach. Notice the above picture? It's from the first science fiction film ever made, A Trip to the Moon (1902). The concept of a "man in the moon" is every bit as clichéd now as it was then. 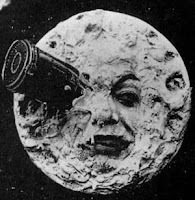 However, the filmmakers decided to have the rocket ship land (crash) in the moon's eye, which causes the man in the moon to cringe in pain. They took a clichéd concept and spun it around, and in so doing, they made fun of a cliché. At the time, this generated a hilarious riot among audiences, but they wouldn't have laughed if they had not already known about "the man in the moon." Making use of clichés for comedy is fun and fairly easy, but what if you're trying to be serious? What if you write science fiction, fantasy, or just fiction? How do you know what's clichéd or not? The first tip is to know your genre and immerse yourself in the already accomplished works of that genre. This, for one thing, will help you avoid what's already been done, or at least give you an idea of how to spin an established concept to make it original. Some concepts never get old (the mentor figure, whether old or not), but the way you do it will help your story stand on it's own. The second tip is to familiarize yourself with your genre's tropes. What's that? Tropes are like clichés (or rather they are) but they are more or less specific to particular genres. For example, in horror films, how often is the last serving character a girl? This is called "The Final Girl" trope, and is most often used in slasher films (not my cup of tea, and yet I know this stuff anyway . . .). Other tropes (in fantasy) includes the use of a Dark Lord, The Orphan Hero, The Christ Figure, and/or others. These aren't essentially bad to use, they just typically come with the genre. Check out http://tvtropes.org for an extremely thorough breakdown of common tropes used in creative fiction. The third tip is to understand one very important concept: what may be cliché for one person may not be for another. If you love stories and read tons, you gain experience, thus you are better able to pick up on clichés. Which leads me to one of my favorite quotes (of my creation) - "When you are able to find clichés in just about everything you read or watch, it means you're getting old." Either that or you're a nerd, to which I proudly admit. Having said that, keep in mind that it's not only your genre that you must know well, but also that genre's audience. Assume that they are more familiar with tropes and clichés than you are. The more you explore your genre, the better you will be able to create something new that will wow your audience. Should you avoid clichés? If you ask me, telling others to avoid clichés is a cliché unto itself. I will simply say, it's up to you. Stories evolve and change over time, but their arcs, from what I've seen, will always be the same. Thanks for clicking in! See you next week. I'm David, and I'm taking September down.